The first print test of Microscope Explorer just came back. Yep, it looks great. But before I press the big red button that starts the actual print run, I’m double-checking (and triple-checking) everything, then doing a second print test with those final corrections. One of main things I’ve been doing is stress-testing the Oracles to make sure they generate good stuff. “Hey,” you ask, “what are Oracles?” They’re the new tool in Microscope Explorer that lets you roll for a random idea to get your history started. The cool part is that you get completely unexpected combinations and therefore completely unexpected history ideas. Each Oracle has over forty *thousand* possible results. But the bad part is that with so many combinations, some of them might be utter nonsense. Utter, pointless, gibberish. The key is the percentage of good results versus nonsense results. Instead of just eye-balling it, I wanted a more quantitative measure, so I built a spreadsheet to randomly roll on each Oracle fifty times, then I rated each result and crunched the numbers to score them. Voila. That’s the success rate for each of the five Oracles i.e. the odds that you’ll get something good when you roll on the table. The first three? Looking pretty good at around 90%. Lurking Darkness dips a little lower to 79%. Not great, but not terrible. 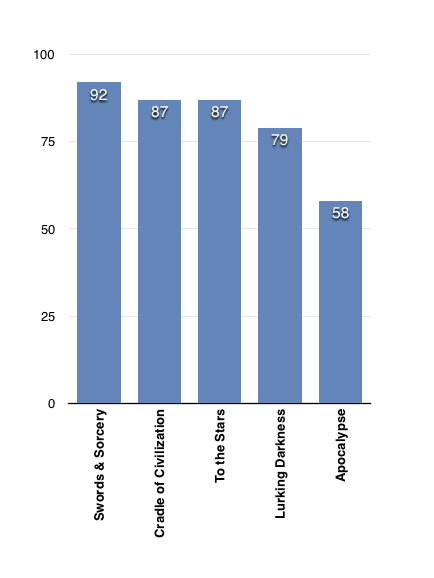 Then the Apocalypse hits and the score plummets to 58%. Why does the Apocalypse crater so hard? Part of the difficulty is that the Oracles are designed to surprise you with interesting interactions and outcomes. But an apocalypse, by its very nature, is a more predictable pattern: things are supposed to go wrong. That’s the whole idea. So before the next print test I’m fine-tuning all the Oracles, because better is always better, but the Apocalypse is getting an overhaul. It may never be quite as magical as the other Oracles, but I think I can move it up a few levels.